Tight lats can lead to forward or depressed shoulders and can limit shoulder flexion. 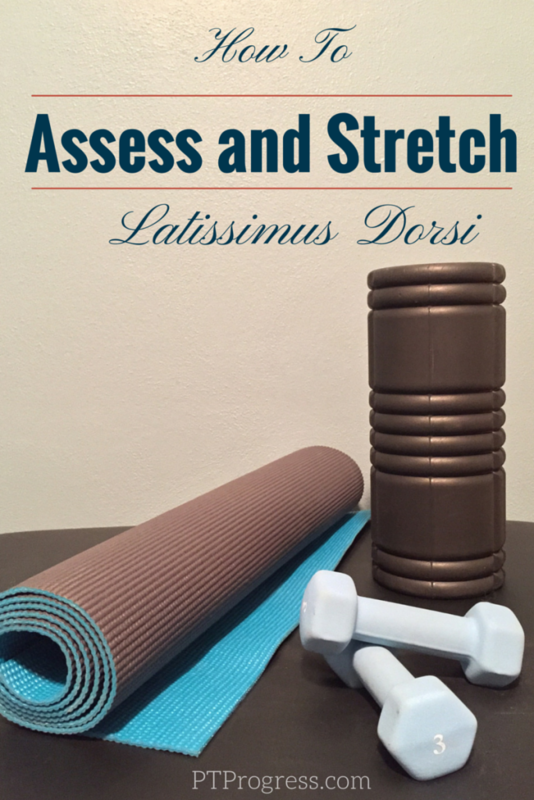 Properly stretching the latissimus dorsi can be done by a therapist or through self stretching in order to restore the lat to its proper length. The action of the lats include: shoulder medial rotation, adduction, and extension. The lats also depress the shoulder girdle and assist in lateral trunk flexion. The latissimus dorsi originate at the spinous processes of the T7-12, the inferior angle of the scapula, the thoracolumbar fascia, as well as the posterior lip of the iliac crest. It basically starts along the entire back from the bottom of the scapula to the top of the pelvis and inserts onto the intertubercular groove of the Humerus. The lats are innervated by the thoracodorsal nerve, C6,7,8. Actively flex both arms overhead monitoring for lumbar extension, elevation of the ribcage, internal rotation of the shoulder or anterior displacement of the Humeral head. Provide correction to faults listed in step 2. (Cue lower abdominals to stabilize lumbar extension and rib cage elevation. Cue to lead with thumb to correct medial rotation). Only have the subject move their arms only to the point where they start the faulty movements listed in step 2. Once an active assessment is performed, a passive assessment can be done to test the lat length, one side at a time. Passively flex one arm overhead, keeping the thumb pointed upward so the Humerus stays laterally rotated. Watch for compensatory motions listed in step 2 above. If pain is produced at end range shoulder flexion and you notice that the scapula is anteriorly tilted, apply manual pressure to the corocoid process to tilt the scapula posteriorly. If this resolved the pain, it may signal that the pec minor is stiff and needs to be stretched. If the humeral head protrudes anteriorly (protrudes through the axilla), apply a slight posterior force directly over the humeral head during passive shoulder flexion. A self stretch can be correctly performed in the position described above (lying face up, knees bent, and raising arms overhead. To get a proper stretch, the lower back must remain stabilized – no arching the back! Raise the arms overhead, keeping the thumbs pointed outward and the back flat on the table. A proper stretch should not be painful. Only raise as far as you are able to without arching your back. The point of this motion is to get movement of the arms overhead (since the lats insert onto the Humerus) and to keep the back flat onto the table. The key to getting a good lat stretch (or anywhere really!) is to move precisely and to avoid substitutions like an arching back or your arm turning inward. What are some of the best lat stretches that you’ve performed?